L.L.Bean customers earn prize entries each time they use their L.L.Bean Visa Card. The Take L.L.Bean Visa Everywhere Giveaway is our way of saying ‘thank you’ to our loyal cardmembers for their patronage. L.L.Bean and Barclaycard US today announced an exciting new promotion for L.L.Bean Visa card members. The Take L.L.Bean Visa Everywhere Giveaway offers an opportunity for L.L.Bean cardmembers to win a cash grand prize of $250,000 or a Trip of a Lifetime valued at $25,000. Now through December 31, 2013, card members will automatically receive entries in the Giveaway, each time they use their L.L.Bean Visa card issued by Barclaycard US for purchases. Card members will earn 10 entries for every travel, lodging or dining purchase, and one (1) entry for all other purchases using their L.L.Bean Visa card. Entries accumulate too, so the more cardmembers use their card, the more chances they have to win. Giveaway entries will be automatically entered for each purchase transaction made starting June 28 through December 31, 2013 -- no hoops to jump through or forms to fill out. There is no limit to the number of entries, no minimum purchase, all entries accumulate. People who don’t have the card can also enter through the mail, without purchase and residents of all 50 states are eligible. 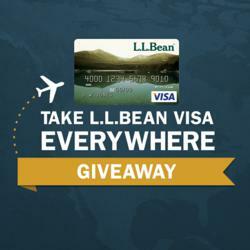 Complete information about the Giveaway is available at http://www.llbean.com/visa. L.L.Bean, Inc. is a leading multi-channel merchant of quality outdoor gear and apparel. Founded in 1912 by Leon Leonwood Bean, the company began as a one-room operation selling a single product, the Maine Hunting Shoe. While its business has grown substantially, the company remains committed to the same honest principles upon which it was built – a focus on the customer, continuous product improvement and innovation, respect for people, preservation of the natural environment and a 100% satisfaction guarantee. L.L.Bean products are rigorously tested, guaranteed to last and always shipped free. The 220,000-square-foot Flagship campus of stores in Freeport, Maine is open 24 hours a day, 365 days a year and welcomes more than three million visitors each year. L.L.Bean can be found worldwide at llbean.com. Join L.L.Bean on Facebook, Twitter and YouTube. Headquartered in Wilmington, Del., Barclaycard US creates customized, co-branded credit card programs for some of the country's most successful travel, entertainment, retail, affinity and financial institutions. The company employs 1,300 associates and was named a Top Workplace in Delaware in 2012. For more information, please visit http://www.barclaycardus.com.